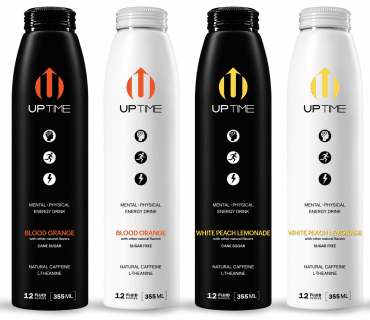 VAN NUYS, Calif.– Premium energy drink UPTIME, announced that the company is introducing its first line extensions with two delicious new flavors, Blood Orange and White Peach Lemonade. Both flavors are available in Original Cane Sugar and Sugar-Free. Blood Orange will be available exclusively at 7-Eleven stores until June 30. White Peach Lemonade will be available nationally on Amazon.com and widely distributed across the United States. In developing the line extension, UPTIME closely monitored flavor trends and consumer preferences. Following suit with its premium positioning in the beverage market, the development team created sophisticated, unique flavors that promise to stand out with target consumers. UPTIME conducted multiple rounds of internal taste tests and spent months fine-tuning the flavor profiles, to create two new flavors that will appeal to existing fans and new customers alike. UPTIME’s Blood Orange offers a great pairing with any meal, and the White Peach Lemonade has a refreshing taste perfect for summer. The collaboration between UPTIME Energy and 7-Eleven aligns with both brands’ marketing expansions for 2019. Launched in July 2014, UPTIME Energy, Inc. was the first premium energy drink to enter the market and is one of the fastest-growing beverage companies in the United States. Packaged in a 12oz stylishly sleek aluminum bottle with a resealable cap, it is a “better for you” energy drink that helps deliver a balanced boost while promoting mental clarity and focus. The drink contains 142mg of natural caffeine or about as much as a premium cup of coffee, and is non-GMO, gluten free, with zero sodium. UPTIME comes in unique sparkling flavors that set them apart from other energy drinks, and their resealable cap allows the consumer to drink at his or her own pace. UPTIME is available in over 25,000 stores nationwide including; Amazon and 7-Eleven. For more information, visit uptimeenergy.com. 7-Eleven, Inc. is the premier name and largest chain in the convenience-retailing industry. Based in Irving, Texas, 7-Eleven operates, franchises and/or licenses more than 67,000 stores in 17 countries, including 11,800 in North America. Known for its iconic brands such as Slurpee, Big Bite and Big Gulp, 7-Eleven has expanded into high-quality salads, side dishes, cut fruit and protein boxes, as well as pizza, chicken wings, cheeseburgers and hot chicken sandwiches. 7-Eleven offers customers industry-leading private brand products under the 7-Select brand including healthy options, decadent treats and everyday favorites, at an outstanding value. Customers also count on 7-Eleven for bill payments, self-service lockers and other convenient services. Find out more online at 7-Eleven.com, via the7Rewards customer loyalty platform on the 7-Eleven mobile app, or on social media at Facebook, Twitter and Instagram.